There is beauty in words. Beauty in a story. And beauty in the characters that fill those stories. Tiphanie Yanique captures all of that in this collection of stories and a novella, steeped in culture and life. I had not intended to participate in this months Spotlight Series as my plate was already full. I could not help but glance through the Graywolf Press catalog though. My attention was particularly drawn to two books, both collections of stories. I couldn't resist. While I settled on one to review here today, I did buy a copy of the other as well to read at a later time. After having read How to Escape From a Leper Colony, I am even more glad of my decision to take part in the tour. Graywolf Press deserves more notice. I hope you will check out the other reviews of Graywolf Press books on tour this week! 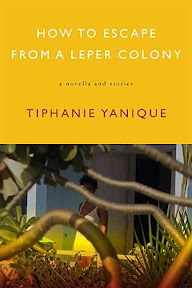 The characters are the main thrust of each of Tiphanie Yanique's stories. And with many of them, the endings gave me pause. The stories may not be wrapped up with a neat little ribbon at the end, but they certainly offer one food for thought. Yanique's writing style is lyrical, and, while several of the stories are straight forward, with others she takes creative license. I was reminded of how much of an art writing can be. I found myself wanting to take my time with each story, lingering over the words and taking in the experience. For each story truly is its own experience. There was not one story in the collection I did not like. In fact, I'd come across one story, decide it was a favorite and then claim the next was a favorite too. This happened over and over again. One of my favorites was "Street Man", about a drug dealer who falls for a straight girl. He is so focused on his own life and his own perception of their relationship, keeping the street out of his relationship with her, that he misses the fact that she may have a life and ideas of her own. There is also the story about a young woman who is sent to live in a leper colony, isolated from the rest of the world. She befriends a young man whose entire world is the island, and they both long to be free. I was moved by "The Bridge Stories: A Short Collection" which is a series of stories seemingly independent of one another but interconnected at their core. Another of my favorites was the novella, "The International Shop of Coffins", covering moments in the lives of three very different characters. The story begins the same in each case, and yet each story is unique but equally sad. The collection is made up of eight stories all together. The stories are about love, despair, regret and longing. They are about dreams, both lost and hoped for. They are set mostly in the U.S. Virgin Islands, touching on several different cultures and lifestyles. This is one of those books that would make a great book club selection, if the group is willing to take a chance on a collection of stories. To see what other Graywolf Press books bloggers are reading for this Spotlight Series, check out the Spotlight Series blog. Book Source: I bought the book myself for the tour. Wow, what a great recommendation. That title has me, too. I always appreciate suggestions of small press publications and short story collections. Two birds with one blog! Oh wow what a great review! I find I always want more, more, more out of a short story but it sounds like these left you with just enough. I may have to take the plunge and look into this book! Thanks for participating and for such a fantastic review! It's hard to resist a book title like that one. I've been hearing more and more about Greywolf Press. I'm going to keep an eye out for this book and others that they have. I agree, Greywolf does deserve more notice. This sounds like a wonderful collection of stories. I'm jotting it down because I'm finally coming to appreciate the art of short stories. I think Graywolf is a great press. I may have to pick up this collection. I haven't been the the Virgin Islands in years but I like the Caribbean as a setting. Its a pretty great compliment to say that all of the stories in this collection were great, so I will have to make note of this book. Great review! I am going to have to look a little harder at Graywolf! Wow, you must have really enjoyed this book. I love Graywolf for poetry collections as well. Thanks for the review. I rarely read short stories, but this sounds terrific. I like the fact that the stories are interconnected. And based on the quote you shared, I have a feeling the writing is lovely. I rarely read short stories too. The way you wrote this review got me really interested. I am currently reading IF YOU COME SOFTLY and everything about the book is beautiful. You find the best books! I'll have to read these stories, for sure! I have this one waiting on the shelves for me; but I have sooooo many unread books up there right now that it will take me ages to finish all of them. I do think I'll move this one up the pile after reading this review though! Great review! The title caught my eye right away. This sounds like a book I would really enjoy! Thanks for bringing it to my attention. I rarely read short stories, but occasionally will read those that I've heard are good (like Unaccustomed Earth by Jhumpa Lahiri that I'm reading now). I'll keep an eye out for this book. I'm going to have to keep this collection in mind. I don't think I've ever read a set of short stories and not been able to pick out one or two I didn't like. Thanks for the recommendation! Liking every story in a short story collection is indeed high praise! I'll have to look at the Graywolf Press books. Love the author name: Tiphanie Yanique. I'll have to remember this when I host the November Novella Challenge this year! If you get the chance, definitely check this collection of stories out. It's well worth it!